For the original arcade game, see Punch-Out!!. Mike Tyson's Punch-Out! !, a.k.a. Punch-Out! !, is a boxing game for the NES developed and published by Nintendo in 1987. When it was first published in the United States, it was known as Mike Tyson's Punch-Out! !, but it was later re-released as Punch-Out!! Featuring Mr. Dream. It is a port of the Punch-Out!! and Super Punch-Out!! arcade games with some variations, and is considered among the best games released for the NES platform. Punch-Out!! features a boxer named Little Mac working his way up the professional boxing circuits, facing a series of colorful, fictional boxers, leading to a final fight with real-life boxer, the then-World Heavyweight Champion, Mike Tyson in the original version. Mike Tyson was replaced with a fictional boxer named Mr. Dream in the re-release. Genyo Takeda, producer of the Punch-Out!! arcade games, directed the NES versions. Because the NES was not as powerful as the arcade hardware, Takeda and his crew realized that it would be impossible for the NES port to faithfully emulate the arcade graphics. Instead of displaying the player as a wire-framed or transparent boxer, they made him small so that players could easily see opponents over his head. He was given the name "Little Mac", and a rough plot, background music track played during fights, animated cutscenes and a password system for saving progress were all added to the design of the game. 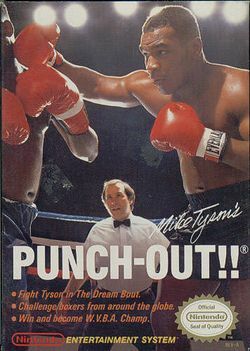 Around the time the Gold Version was released, Nintendo of America's founder and former president Minoru Arakawa attended a boxing match featuring Mike Tyson. While watching the boxer fight, Arakawa was inspired to use the athlete's name and likeness in the upcoming port of the Punch-Out!! series. Before the release of Mike Tyson's Punch-Out!! in North America, Nintendo released it in a gold-colored Famicom cartridge simply titled Punch-Out!! in Japan, without Mike Tyson in it, as a prize for the Golf US Course Famicom Tournament. This version's final boxer was Super Macho Man, who was also the final boxer in Super Punch-Out!!. When Mike Tyson's Punch-Out!! sold well in North America, Nintendo later released the Mike Tyson version in Japan. After Nintendo's license to use Mike Tyson as a special Punch-Out!! character expired, Nintendo replaced Tyson with a fictional character called Mr. Dream and re-released the game in North America as simply Punch-Out!! in August 1990. Along with several NES titles by Nintendo, Punch-Out!! featuring Mr. Dream was later ported to several other platforms in Nintendo media. In Animal Crossing for the GameCube, it was one of the rarer unlockable NES games one could acquire within the game. It was also released through the Wii's Virtual Console service on March 30, 2007 to the European and Australian regions, April 3, 2007 in Japan, and in North America on April 16, 2007. During that release, reports have surfaced stating that when the game is played in progressive scan, the Virtual Console version of Punch-Out!! suffers from a lag in controls, which significantly raises the level of difficulty. This page was last edited on 26 September 2015, at 17:47. This page has been accessed 122,638 times.